REGISTRATION IS NOW OPEN FOR THIS PRESALE. If you're pregnant or have a new baby (6 months old or younger), we invite you and one guest to shop the New and Expectant Moms Presale. You won't have to stand in the entrance line as long, you'll get a little more elbow room while shopping, and there will be lots of experienced MOMS available to help you find all the things you need for your little love! You DO NOT need a separate ticket for entry. This pass will get you FREE entry into the sale. YOUR PARENTING PARTNER or GUEST does not need a separate ticket. This admission allows your family member to join you. 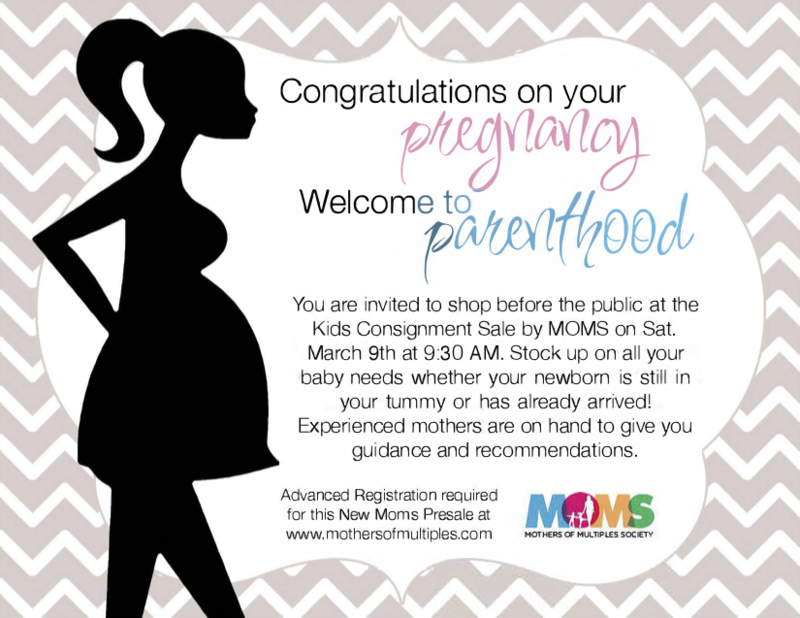 If your guest is another pregnant or new mom, please have her register separately. NOTE: Mothers of Multiples Society (MOMS) members are NOT eligible for this Presale.